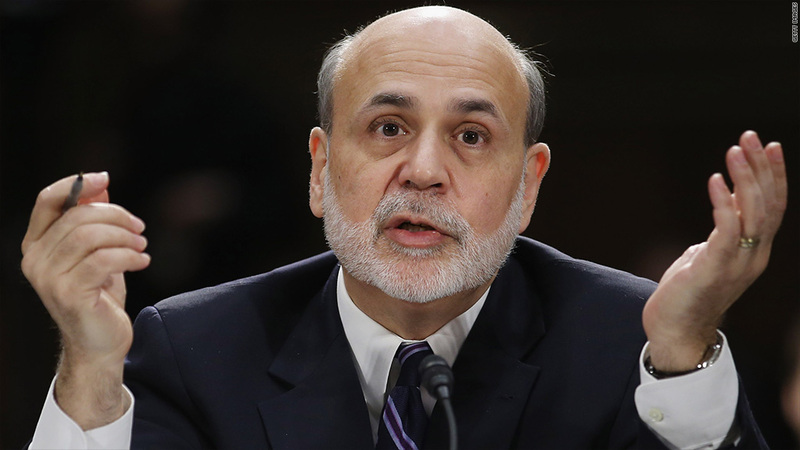 Federal Reserve Chairman Ben Bernanke said he doesn't see any evidence yet of a stock bubble. Stocks have recently been hovering near a five-year high, but Federal Reserve Chairman Ben Bernanke says a stock market bubble is not in the works. "I don't see much evidence of an equity bubble," Bernanke told the Senate Banking Committee in his semi-annual testimony on Tuesday. Yes, stocks are high. The S&P 500 (DIVD) and Dow have recently been trading at levels not seen since 2007. But Bernanke thinks the gains are warranted, given strong company earnings recently. The Fed's stimulative policies are meant to spur spending. Bernanke pointed to stronger housing and auto sales recently as proof that his plan is working. The Fed's recent policies, which have kept interest rates near zero since 2008, have a secondary effect of driving investors away from low-yielding bonds, in search of higher-yielding assets like stocks. Observers, even including some Fed officials, have recently argued that the "reach for yield" could be fueling a bubble in bonds, farmland and other assets. Bernanke admitted that low interest rates "could encourage excessive risk-taking," but he assured lawmakers that he's closely watching for bubbles. Right now, the risk doesn't outweigh the benefits "of promoting a stronger economic recovery and more rapid job creation," he said.